Report: Eddie Allen - Courtesy of British Cycling. Chris Newton took the Men's Points race in typical style, with a little help from teammate Geraint Thomas. Newton dominated the race from start to finish, as he has so many other Points races in his long and illustrious career. Here's how the race was won. Newton took top points in sprint one, benefitting from a great leadout from Rollers teammates Geriant Thomas and Tim Kennaugh. Immediately after Sprint 1, Alastair Rutherford went away but didn't make it stick. The next attack came from Dean Downing and Pete Williams, provoking a response from the Rollers duo of Thomas and Tim Kennaugh, who reeled Downing and Williams in prior to Sprint 2. Right on cue, Newton appeared from nowhere and took 5 points and went away with four other riders, fragmenting the field. Sprint 3 came and saw Andy Tennant take 5 points, with Newton also scoring and maintaining his overall lead. The race settled and regrouped as Sprint 4 approached and once again Thomas provided a leadout for Newton who took a further 5 points, stretching his overall lead to 8 points over second placed Tennant. Dean Downing leapt away alone straight after the sprint and whipped up the crowd before the bunch raised the tempo, swept Downing up and once again the canny Newton took top points and secured victory with one sprint still to go. Dean Downing continued to entertain, showboating at the top of the track and upstaging Pete Williams, who had mounted a lone breakaway. Williams' solo breakaway was not to be and he was reeled in with 3 laps to go. 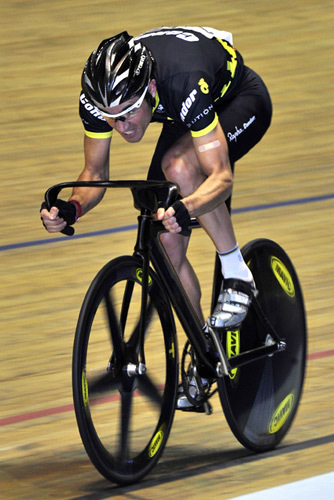 The final sprint came and Luke Rowe took the final 5 points. However, the final sprint was academic, with Newton having already sewn up the win. First event proper of the night's proceedings was the Motor Paced Scratch race. Anticipation built as the Derny's speed increased, with big guns Geriant Thomas, Chris Newton and Andy Tennant showing their faces at the front in the opening stages. With six laps to go the Derny pulled off, leaving the bunch to fight it out. Newton made the first move, coming over the top as the bell tolled, immediately gapping the field. Tennant bridged and took the front, stringing the field out. With a lap to go Ed Clancy hit the front and went on to take the win ahead of Geriant Thomas, with Luke Rowe taking third. 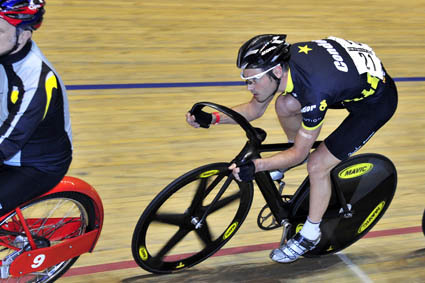 Tempo's duo of Ed Clancy and Andy Tennant comfortably topped the leaderboard in the perennial crowd-pleaser of the Madison Time Trial, beating their nearest rivals Slicks by more than 2 seconds. Since the inception of the Revolution Series, the Madison 1km TT has been a firm fixture, and Clancy has figured strongly throughout.